Live and Uncensored! : What if You Settled for the First Thing that Came Along? What if You Settled for the First Thing that Came Along? Hyundai gives you Anachronistic City, land of the (decidedly) brave folk who settled for first-generation technology. 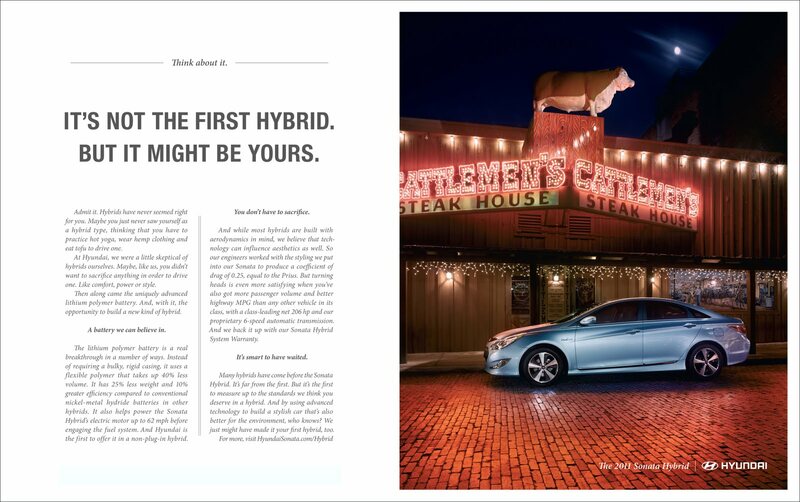 This is its sly approach for promoting the Sonata, its first-ever hybrid vehicle (late to the game, and probably not even your first-ever hybrid vehicle). I also like the tagline: "Think about it." Nice and clean while lending plenty of creative flexibility. Good solid work by Innocean; print spreads below (click to enlarge). 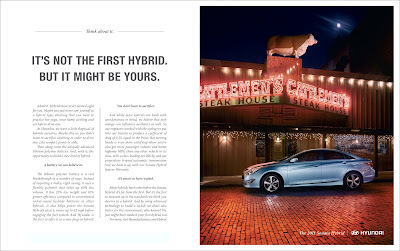 I still don't think I'd ever get a Hyundai but that's just prejudice. Maybe if they keep at it. Nice work! Interestingly enough the biggest Hyundai dealer is here up in Albany. I see a lot of them on the road. The styling of the Sonata in my opinion is nicer than most of the Asian cars now. But haven't been inside one yet. I tried to fit inside one but couldn't (if that counts), but I'm 6'6". 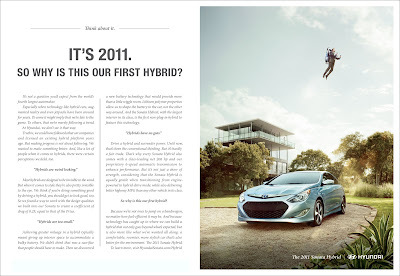 Great work on the advert though, as long as you don't think about the predecessors, nor whether they should be rewarded for their hard work and innovation. Perfect for the general consumer.